Xils Lab is branching out from the soft synth world to give us a new De-Esser called DeeS. This plugin is a quick solution to cancel the sibilance and harsh frequencies in tracks. 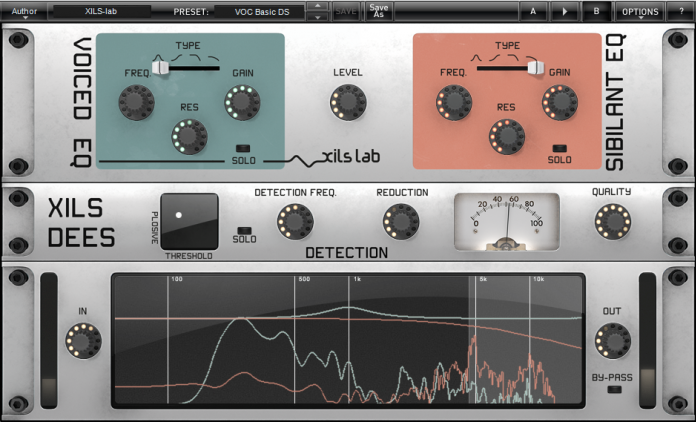 The first in a new plug-in product line designed to provide phenomenal production possibilities, XILS DeeS does exactly that by being extremely easy to use in the first instance — simply tweak the DETECTION FREQ. knob and apply REDUCTION as needed… no more sibilance! DETECTION can be applied quickly, combining with proprietary PLOSIVE detection to result in lively, natural voices. Getting clean, professional vocals, dubbing recordings, or restoring previously recorded voices to their natural glory has never been so easy or speedy. Job done? If you say so. Yet there is so much more to XILS DeeS than first meets the eye (or ear). With its clearly labelled dual signal path with SOLO buttons as well as associated sound sculpting controls for each channel — VOICE EQ (colour coded in green) and SIBILANT EQ (colour coded in orange), XILS DeeS is as easy to understand as it is to use. Users can equally easily visualise what exactly it is that they are doing thanks to a realtime frequency graph showing four frequency bands sharing that same colour coding for instant correlation between eyes, ears, and brain. That’s the way it should be, right? In typical XILS-lab style, other advantages abound. Unlike traditional de-essing tools, XILS DeeS does not result in unwanted, unnatural-sounding filter sweeping effects, yet users can get truly creative with almost endless possibilities for altering, adapting, or applying polish to the character of voices with those two independent EQ’ing paths (with analogue-style, zero-delay feedback filters). Special effects, even? Why not! Why stick solely to working with vocals? Why not use XILS DeeS to transform drum sounds (by EQ’ing hi-hats or cymbals, for example) or even slap bass (by EQ’ing the more metallic-sounding element of such sounds)? Simple and special, see. So, whether you want to bring back the emotional quality to vocals you’ll never be able to record again, clean up your own voice recordings for a blog or a corporate video, ensure your customers of flawless dubbing technique, turn an amateur into a seasoned speaker, or adapt a voice into a specific sonic or musical context, XILS DeeS provides professional results — rapidly and spontaneously. Sibilance need not be so stressful! So why not let XILS DeeS take the s out of stress?